Let's face it, it's 2018 and this "Fiverr" thing isn't getting any easier. You spend hours setting up your gigs, days waiting for orders to roll in, and weeks trying to hustle your first few sales. I know, because I've been there myself. I did the research. I put in the long hours. I took consistent action. And I gave up... multiple times. The good news is, Fiverr isn't a lottery, and your ability to make money on this platform rests largely on strategy... not luck. What you're about to read isn't just another half-assed, rehashed Fiverr optimization post. In fact, most of what you'll learn here isn't even been taught anywhere else online. It's pretty obvious when you think about it, but it's easy to forget that appearing on any page other than the first will drastically reduce your gigs visibility. Well, the ranking process is handled by Fiverr's proprietary algorithm, which looks at different "quality signals" in order to determine which gigs deserve visibility over others. While there's no public record of what this algorithm looks at, most established Fiverr sellers would agree that it boils down to four fundamental signals. Everything I'm about to share with you feeds into at least one of these quality signals, whether directly or indirectly. 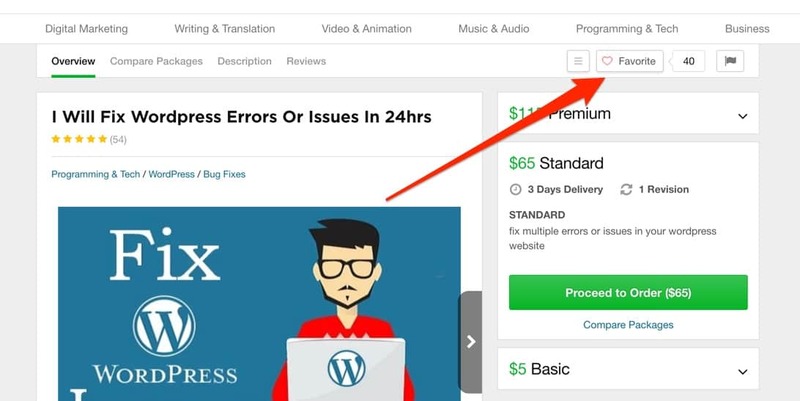 If you want something shorter and more memorable — which always helps with promoting your gig outside of Fiverr's platform — you'll need to use a little hack when you first create your gigs. Now isn't that a more a favorable URL? 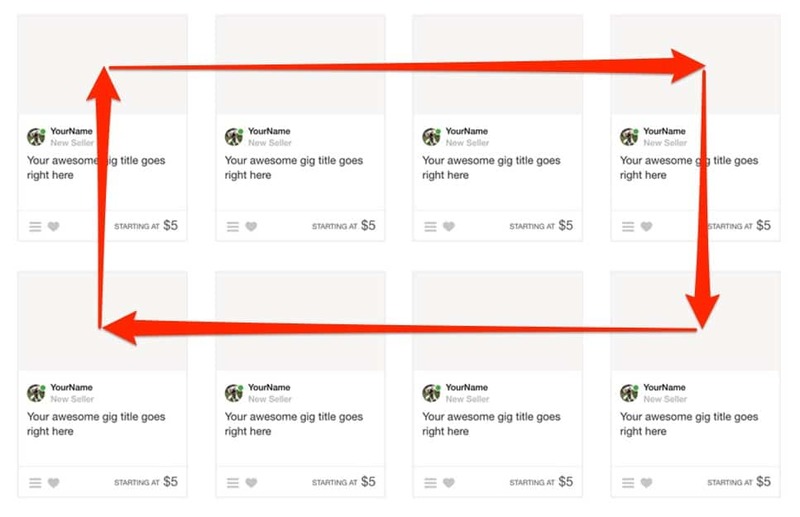 Note: You can also generate a shortened "social" URL through your Fiverr seller dashboard, but I still like to do this since you can't count on every person to use and share your social link. I'm a strong believer that when it comes to naming your gigs... shorter, punchier gig titles are the way to go. In the early weeks (and sometimes months) of a new gig, however, you'll likely struggle to get much visibility as Fiverr slowly gathers data on your gigs performance. 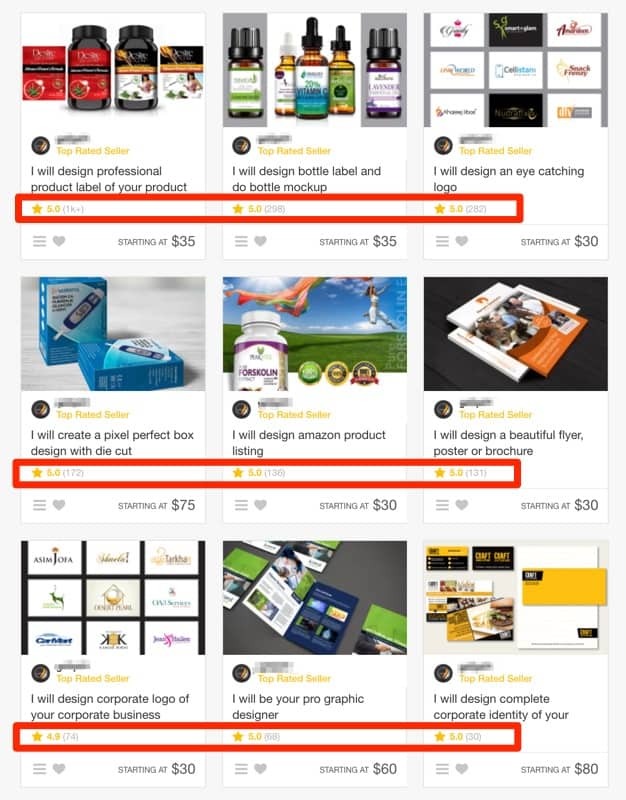 If someone types "modern logo" into Fiverr's search box, the search algorithm has to decide which of the 3,951 results to show on the results page. That's gonna be a tight squeeze for a brand new, unproven gig. On the other hand, if someone types "modern logo 24 hrs" into the search box, you're only competing against 986 results, which gives you a MUCH better chance of actually making the cut. These are very niche specific so it's worth doing the research (like I did in the screenshots above) to see which modifiers narrow down your competition, as not all of them will. This might seem like another angle on the last tip, but it's different in the sense that it actually changes your gig's fundamental offer. Most people understand the idea of niching down — in that you're targeting a smaller subset of a bigger market — but few people (especially on Fiverr) seem to execute on this properly. I'll explain this one using the "Article & Blog Posts" subcategory. The screenshot above conveniently highlights one of the first mistakes I see people making on this platform — assuming that Fiverr's subcategories are niches. The truth is, these subcategories contain thousands, if not tens of thousands of listings, and so creating a gig that offers "article & blog writing services" will put you up against 100% of the sellers in that subcategory. 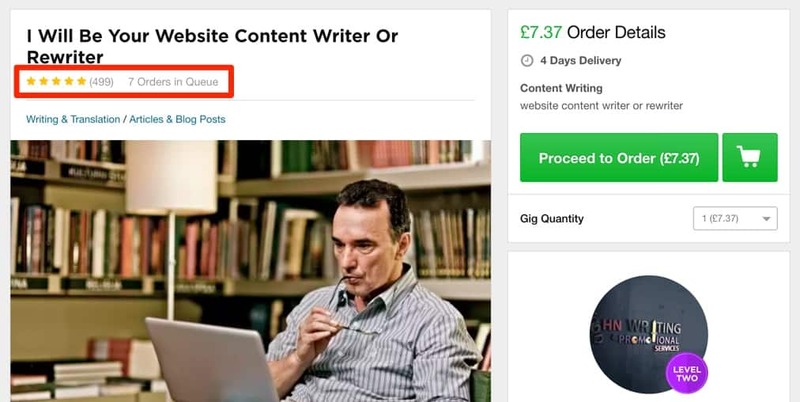 That's a guaranteed way to #fail on Fiverr. The idea isn't to guess your way into a profitable niche, but to identify top selling gigs by looking at the correlating data. 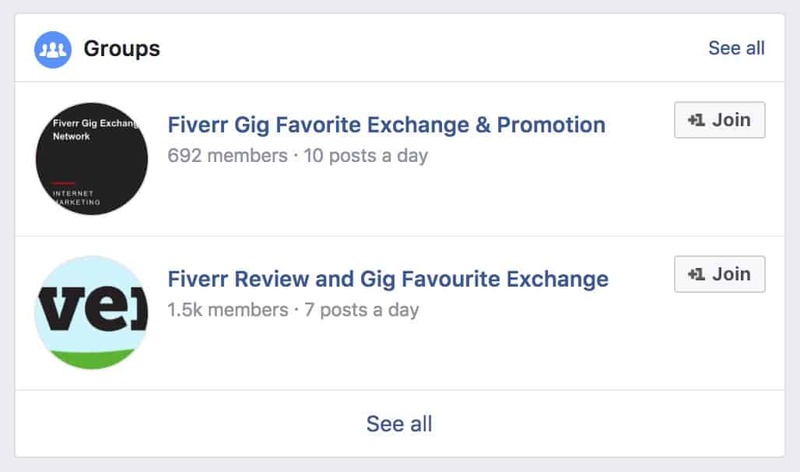 In the case of Fiverr, the closest data we have is the number of reviews a gig has. There's no magic formula for this, it's simply a case of navigating into your chosen subcategory and noting down (or favoriting) any gigs with a significant number of reviews. If you haven't already started your Fiverr account, or you plan to create a new one for whatever reason, this one's for you. 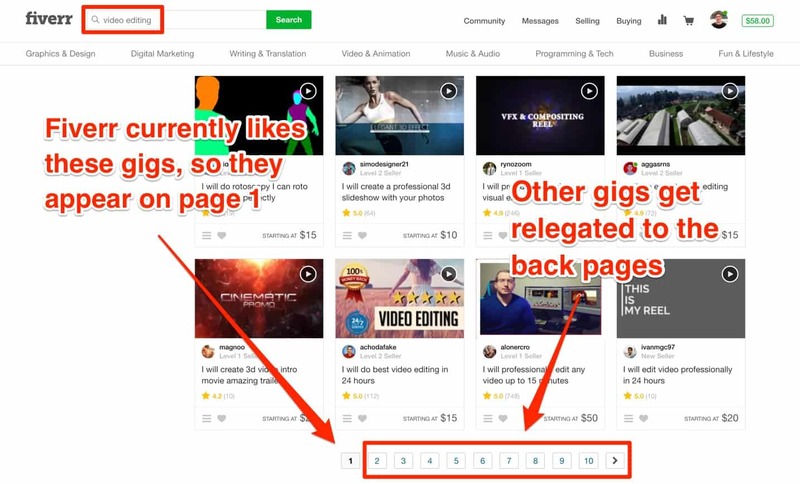 As you've probably guessed by now, Fiverr is heavily reliant on keywords to understand the nature of a gig, whether these words appear in your gig title, description, or tags. There is, however, one sneaky workaround you can leverage if you're just starting out on Fiverr. If ranking higher wasn't incentive enough to do this, it also helps your conversions since potential buyers will view you as an expert in that field. If there's one counter-intuitive truth I've learned from my time as a freelancer, it's that charging more money doesn't necessarily cost you sales. In fact, from many of my own "experiments", I've actually found the opposite to be true. Yep, sales increased when I raised my rates. And there's probably more to it than you think. They're friendlier, they know what they want, they communicate clearly, they're less picky, and, most importantly, they're happy to pay extra for quality. In fact, it's clients who actively seek out these $5 bargains that give the platform a bad name. When you cater your services to these kinds of people, you're just asking for trouble. Raising your prices is a hard a barrier to overcome for many freelancers, but it's something you NEED to get comfortable with if you wanna start making some serious cheddar on Fiverr. Note: The only exception is at the very beginning when you're trying to get your first few sales and reviews, but even then, charging less isn't always the way to go. Don't be afraid to test. The fact that there's a counter on this metric indicates to me that Fiverr uses this as a quality signal, so always encourage people to favorite your gigs... even if they don't place an order. At the very least, a high number of favorites contributes to your social proof which will also help conversions, so it's a win-win. And yes... Fiverr HATES this kind of group manipulation, so abusing it could result in you getting your account banned. Basically, ifyou're going to do it, do it in moderation. It's easy to sit back and wait for Fiverr to send you new leads all day, but with the right strategy you can effectively double or triple the value of your existing leads through the power of a gig-network. A gig-network IS that strategy, and it's essentially just a series of gigs that offer a logical next step for your clients; a natural progression from one purchase to the next. As you can see, there's a clear, natural progression. A client could realistically order my YouTube gigs in sequential order to have everything covered, and that's EXACTLY what you want to achieve. There's no better person on the planet to recommend your service than someone who's just had an amazing experience with your service. (Sounds obvious when you read it, right?). Once you have your incentive nailed down, it's just a case of messaging your clients after they've left a 5-star review. "Hey [client name], thanks again for your order! Just wanted to let you know that I'm offering [incentive] in exchange for referrals. If you could mention me to anyone in your circle who might be interested in what I do, I think we could both benefit from it. While this was a reasonable trade-off for sellers to maintain ratings on their profile, it didn't exactly leave buyers with an accurate/reliable scoring system. "Hey [client name], please see the attached [deliverable]. Before leaving feedback, please let me know if you have ANY issues with your [deliverable] and I'll do everything in my power to correct it for you at no additional charge. I want you to be 100% satisfied with my work, otherwise I insist that you ask me for a full refund. No hard feelings. In 98% of cases, even the most disgruntled clients will play nice after reading this message. Reason being, even if they're not satisfied with the deliverable, you've already presented them with not one, but TWO easy resolutions. And the other 2%? Well, unfortunately, there are some people in this world who would rather hurt your credibility (and ultimately your income) than accept their money back. As you know, engagement is one of the fundamental quality signals that determine which gigs rank where on Fiverr. The only way to generate these engagement signals is to start sending traffic to your gig, because without them, Fiverr will be reluctant to send you some of their own traffic. "Hey, look guys, I'm sending all these people to my gig and they clearly like it, you should give me some credit here." Of course, your gig needs to be on point if you want that traffic to actually resonate and engage with your gig. This doesn't work without a quality offering in the first place. So the question is, how do you actually send traffic to your gigs? My favourite strategy is to use highly-targeted Facebook groups along with something I call the "feedback technique". If I were promoting a video editing gig, for example, I'd join a YouTube community, integrate myself a little, and then make a post. Hey guys, I'd really appreciate some feedback. I've just set up a gig on Fiverr, and since nothing is really happening I was hoping I could get some feedback from this community. Any ideas why it's not converting? Any help is appreciated. Unlike most peoples attempt to blatantly self-promote, this approach actually encourages members of the group to get on your side. Better yet, you'll get genuine feedback on your gig from the very people who will likely buy it. The Pareto Principle (also called the 80/20 rule) is something everybody should be aware of by now. Well, you can see evidence of this principle at work by looking at the gig sales (or reviews) of any popular Fiverr profile. I can't fit them all into the screenshot above, but this seller has 23 total gigs with top 3 making up around 80% of their total review count. Thanks to the Pareto Principle, there will always be a small handful of gigs that outperform the rest, and ultimately account for the majority of money you make on Fiverr. Period. Once you identify these gigs, and it may take some time, you can make similar versions of the same gig in order to target related, but also more specific keywords. 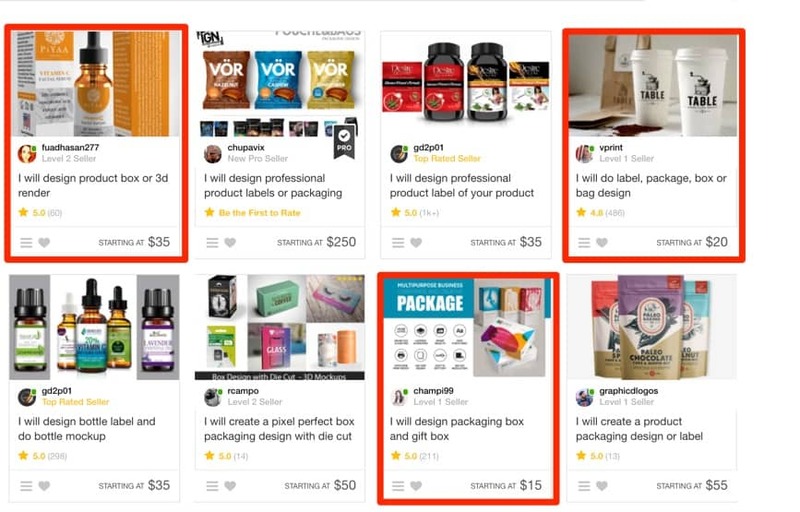 Looking at the example above, you can see that the best selling gig focuses on product label design. And if you look even closer, you'll notice the seller has already started to capitalise on this information by creating a version for bottle labels. A bit of research shows me that people are also interested in product boxes, packages, bags and even gift box designs. Because those keywords don't appear in the sellers product label gig, which means Fiverr probably NEVER show it for these search terms. You have to treat the algorithm like a baby. Assume that it can't associate words with one another and feed it with those variations. If all you take away from this article is to give an unexpected bonus on every order you get, it'll be worth the weeks I spent writing it. Seriously, this is one of the easiest ways to overdeliver and get clients singing about your services. The reason most people don't do it, however, is that it can be too expensive and time consuming to come up with a bonus for every new order — especially when you're only making a few bucks on it. ​The good news? You don't have to. In fact, I advise against it. The secret is to have something relevant enough to be genuinely useful to the client, but not so relevant that it can't be given to other clients who order the same gig. In other words, instead of creating bonuses that are order-specific, you need to create bonuses that are gig-specific. To give you an example, let's imagine I have a logo gig offering clients 1 logo concept for $20. Which bonus would be better? While the first option is good, it requires infinitely more work to deliver vs the second option, which can recycled for every order without any additional production time. THIS is how you should be approaching your free bonuses, and you can apply this kind of logic to pretty much any type of gig. If you're not using these on ALL your gigs, you're leaving money on the table. No question about it. The ability to directly influence how much people spend on your product, simply by offering them a choice. This isn't theory I'm spewing here. Plenty of experiments (like the one below) have been carried out to prove that this psychological phenomenon exists. "People were offered 2 kinds of beer: premium beer for $2.50 and bargain beer for $1.80. Around 80% chose the more expensive beer. Now a third beer was introduced, a super bargain beer for $1.60 in addition to the previous two. Now 80% bought the $1.80 beer and the rest bought the $2.50 beer. Nobody went for the cheapest option. Third time around, they removed the $1.60 beer and replaced with a super premium $3.40 beer. Most people chose the $2.50 beer, a small number chose the $1.80 beer and around 10% opted for the most expensive $3.40 beer." So, by only offering a single price, you remove the ability for those people to give you more money for a more premium service. You want more monies, don't you? I recently put this theory to the test by adding a $300 high-end gig package to one of my existing gigs. If you're not taking advantage of high-value gig packages, you're literally leaving money on the table. 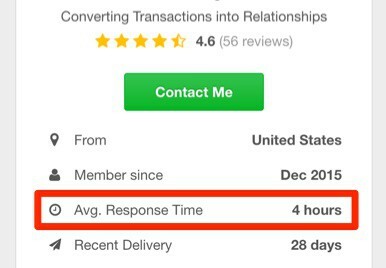 Average Response Time is a big deal on Fiverr. If you've ever browsed the platform as a client, you've almost certainly looked at average response time before pulling the trigger. Not only would I consider this a direct ranking factor, but a stellar response time will also encourage engagement and sales. The problem for anyone with a semblance of a social life, however, is that being on call at all hours of the day, every day, is simply an unrealistic to run a business — and I couldn't a agree more. So how do you keep this little metric in tip-top shape? Well, the first thing you should know is that Fiverr only measures the time difference between a clients message and your first reply. That means all interaction (or lack thereof) between you and the client after your first reply isn't counted towards your Average Response Time. By using a generic AFK—or 'away from keyboard' message—you can immediately reply to any message, politely let the client know when to expect a personal reply, AND maintain your response time. This way, no matter how busy you are, you can always take 20 seconds to open up your laptop (or whip out your phone) to insert your AFK quick response. You didn't think I'd leave you hanging on a script, did you? Unfortunately, I'm currently away from my computer so it's a little difficult for me to properly respond your query at this time. Give me a few hours and I'll personally get back to you on this. Sorry for any inconvenience caused. We've talked a LOT about keywords already, but I couldn't end this post without giving you the heads up on this ninja tactic. You already know that gig reviews are a big deal on Fiverr. That's old news. Bu with all the hype surrounding reviews, it's easy to forget that Fiverr also gives YOU (the freelancer) an opportunity to review your client. You NEED to be actively doing this. Not only does it show Fiverr and potential customers that you're responsive, but it also gives you an opportunity to reinforce your gig's keywords. When writing a client review, take note of which gig it relates to and strategically work in your core keywords. "Thank you so much for ordering my Facebook ads consulting gig! [NAME] was amazing to work with and I hope to have many more clients like him/her in future." And don't just say the same thing for every review, though. You should take the opportunity to mix things up, and even hit other keywords potential clients could be searching for. "I enjoyed working on [NAME]'s Facebook ad strategy, and we were able to work together to create several profitable ad campaigns. AMAZING." I talked earlier about the importance on niching down on Fiverr, but some savvy-eyed folks are quick to point out the obvious. This broadly-targeted gig not only has an impressive 499 reviews, but it's also consistently bringing in new orders with 7 currently in queue. Gigs like this encourage newbies (and even sometimes experienced sellers) to set up their own generic gigs, but in the vast majority of cases, they're left scratching their head as to why nobody's buying. 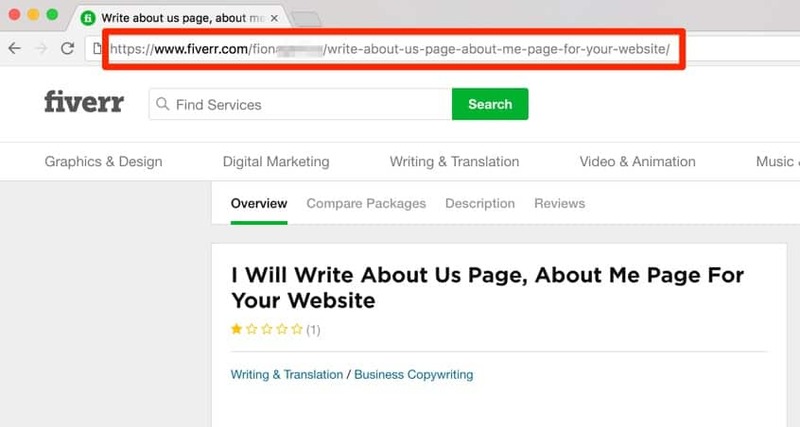 The more authoritative a gig is — as in, the more sales and positive reviews it has — the more exposure it is ultimately given in Fiverr's search results. As you can see, this used to be a gig offering article rewrites to pass an online plagiarism service, called Copyscape. This was the "foot-in-the-door", so to speak. With only a handful of other sellers to compete with, this guy was able to consistently generate sales and reviews over time. Once he managed to build up enough authority (and ultimately ranking power) on this gig, he was then able broaden and "rebrand" the service in order to sell to a larger audience. While this trick is mostly used to tap into a larger market, it can also be used to transform a service-based gig into a product-based gig. Easy when you know how, right? This one follows the same principle as the last... with a key twist. While gig authority represents the overall "ranking power" of a gig, profile authority applies at the account-level. It represents your ability to not only get people clicking the buy button, but to also deliver a quality service, on-time and to each and every clients unwavering satisfaction. Fiverr gauges this through the same quality signals I've been banging on about throughout this entire article. There's no official metric for it, and there's no r​​​​​eal way to actually measure the "authority" of your Fiverr profile. But I we do have the next best thing. 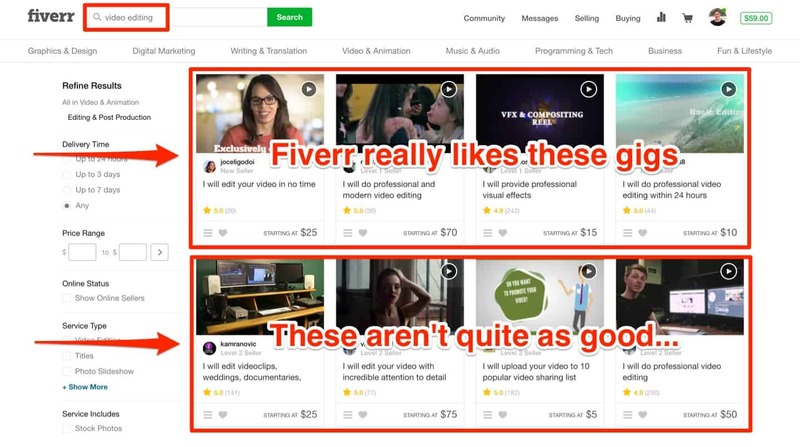 Of course, I'm talking about what Fiverr refers to as 'Seller Levels' — where freelancers are essentially "promoted". You know what they say, a rising tide lifts all boats. If there's one thing I've seen from my time on Fiverr, it's that promoted accounts get more visibility on ALL of their gigs — old and new. Be consistent, and be patient. Fiverr takes time. I hate to end on such a dampening note, but this is perhaps the single most important tip to take away from this post. Fiverr is a marathon, not a sprint. Give it the time and attention it needs, and soon enough, you'll have an asset that can easily generate thousands of dollars in revenue each month. If you want to start making money on Fiverr, you need to finally ditch the post-and-pray approach. 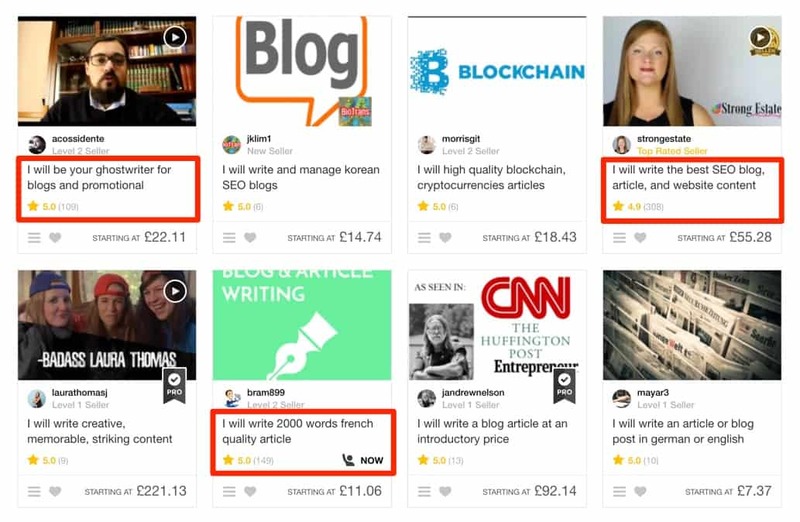 Fiverr's algorithm runs on a set of principles that, once understood, allow you to turn this once low-level platform into a powerful sales engine for your freelance business. Feed it with the same quality signals I've outlined here, and I guarantee you'll see an amazing shift in the way Fiverr treats your gigs. If you have any questions or you have an advanced Fiverr strategy that I haven't covered here, please let me know in the comments. I’ve just returned to Fiverr after a long hiatus and your tips helped tremendously. Thanks! Thanks for dropping by and leaving a comment. Good luck! Great article man! Try to integrate discus with your site. I have delivered over a 100gig with just 50% reviews. 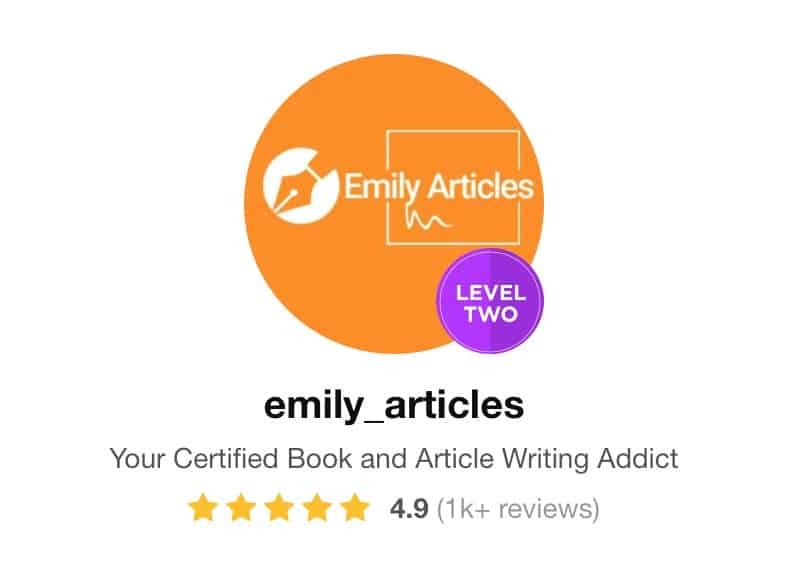 I use to be in the first page, but suddenly dropped after a wicked buyer gave me a bad review and since then my gig ranking has been going down. Though am not giving up. Like you said, Fiverr business is a marathon and not a sprint. All same, thanks for taking your time to write out this article. Its awesome, educative and inspiring. I am actually planning to start as a seller (been a buyer all this while) and this article taught me what I should pay attention to. Interestingly, my name also starts with VJ like the previous comment but I am not him. So I took that as I a sign that this could be something that I could potentially be successful at. You’re awesome man, Indian Guy reading your blog.I was searching for People per Hour Blog of your’s as well.Didn’t found out. Keep making such Blog it was really awesome. Wow! All these tips were absolutely amazing. I have thought about becoming a seller on Fiverr over the years. These approaches allow me to feel more comfortable and confident to take the plunge. can you review my Gigs and tell me what changes are require? I hope You Check it. Great tips. Check out more great and useful tips on the Android and iOS free application called Fiverr Tips! I have been a fiverr buyer since 2014 and now want to start selling services on fiverr. I have really liked your article and wanted to ask about my username. I created my username without thinking of selling and now I know I cant change it, should I open a new account optimized for selling or just start selling on my current account. Thanks so much for this whole encompassing article. I am really inspired and hopefully look forward to increasing my revenue on fiverr through your combined strategies. Thanks a bunch, I really appreciate it . Great and really nice and helpful article..
Great advice, but I’m slightly confused… Didn’t you leave Fiverr altogether in September 2017? Is it now OK to use Fiverr again? Have they solved those issues to your satisfaction? You are correct, I left Fiverr and no longer use it myself. This is just a few things I learned from my experience on the platform and I wanted to pass it on to anyone that still prefers to use it as a client acquisition channel. I still don’t recommend it personally, but if you’re going to use it, it’s worth knowing these things. At the moment I get most of my clients through referrals. If that ever dried up, I’d probably go straight to Upwork. Hey, Great article. I read on one blog that changing the country does make your gigs sell, quickly. Does that happens? Holy, you are a beast, Lewis! You are wonderful, Perfect write up! !